A few days ago, the world happiness index was released; it surveyed a total of 156 different countries. 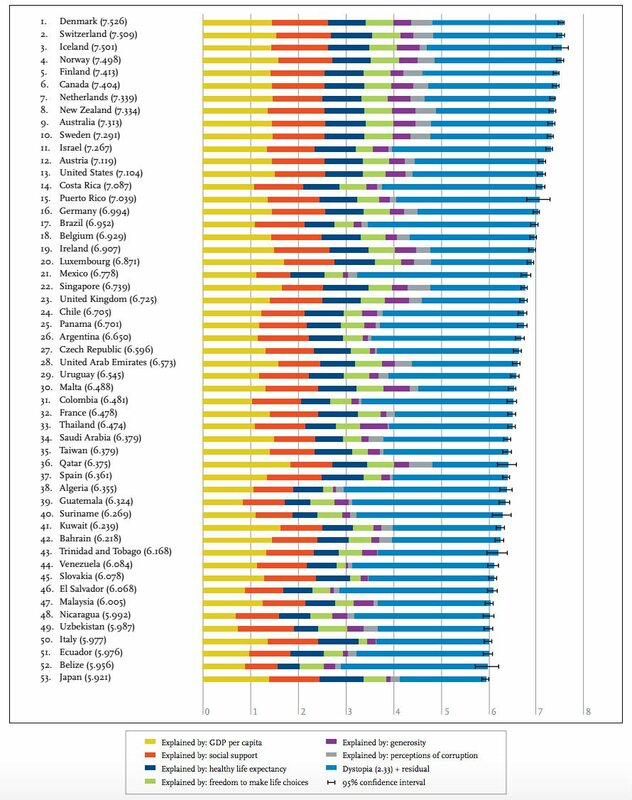 This is quite an interesting piece of research ranking countries by their happiness levels; the survey was released a few days ago in Rome, ahead of the UN World Happiness Day, which occurred on March 20th 2016. The survey is one which takes several factors into consideration beginning with GDP per Capital, social support, healthy life expectancy at birth, in addition to freedom in making choices, generosity, and perception of corruption. The highest ranking country for this year was Denmark, followed by Iceland, Norway, Finland, Canada, Netherlands, New Zealand, Australia, and Sweden. Check out the below chart, in order to view who landed in the top 50 spots.